The photo below is dated 1895 and is of the interior of the Lodge. It was discovered recently by Edward and Joanna Martin in Woodbridge Library mis- referenced as Letheringham Hall. For the full listing of Letheringham Lodge, please click here but we are sad to say that Maud Gross was rather rude about the beautiful Lodge and called it ugly so do prepare yourself. 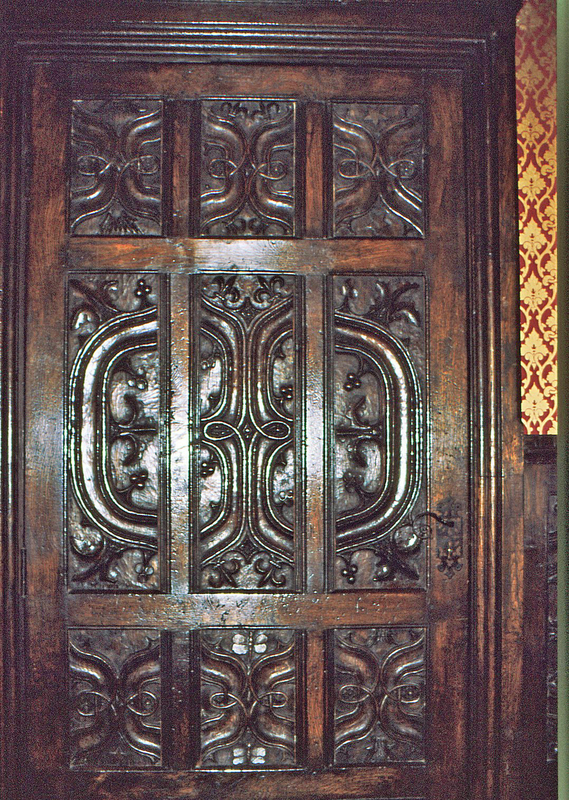 This panelling was taken to Brodick Castle in the 1920's as both properties were is common ownership. It is now owned by the National Trust for Scotland. The 1919 sale particulars for the Lodge mention that on the wide first floor landing there was ‘Old Highly Ornamental Oak Panelling’. Unfortunately this was removed c.1920 and taken to Brodick Castle on the Isle of Arran, Scotland. But luckily it was seen in situ and recorded by the Revd Edmund Farrer in 1915, which enables the existing panelling at Brodick to be confidently identified as having come from Letheringham. Some of the panelling bears the Wingfield coat-of-arms and the family’s double-winged lure badge, but sprinkled about are other carved badges – trefoils, butterflies and stars. The trefoils relate to the arms of the FitzLewis family and Sir John Wingfield (d. 1481) married Elizabeth FitzLewis; his son, another Sir John (d. 1509) married Anne Touchet, the daughter of Lord Audley – and their family badge was a butterfly; his son, Sir Anthony (d. 1552), married Elizabeth de Vere – and their family badge was a star or mullet. The star occurs on the same panels as the Wingfield winged lure, making it likely that the panelling was installed for Sir Anthony Wingfield and his wife. Sir Anthony was an important Tudor courtier – he was, from 1539, Vice-Chamberlain of the Household, Captain of the Guard and Privy Councillor to King Henry VIII, he was made a Knight of the Garter in 1541 and was later an executor of the king’s will. He continued to serve under King Edward VI and was Comptroller of the king’s household by 1550. His wife was the daughter of Sir George de Vere (the younger brother of John, 13th Earl of Oxford) and the sister and co-heiress of John, 14th Earl of Oxford (d. 1526).